23 Bees 3pc Hanging Planter Set is the perfect addition to your home or office. We believe in natural living with a modern flair. Through innovative design and process, we want to help you bring nature's beauty inside. Order now and experience your space transform with 23 Bees. Stay trendy with these ceramic hanging pots. Easily create stylish arrangements to display succulents, air plants, or small cactus. Plants are not included. This 3 piece contemporary hanging planter is perfect for adding a modern touch to your entryway, living room or bathroom. Just add air plants or your favorite succulent. Your friends and family will thank you! 1 pot x (8.6"H x 5.3"W x 3.3"D), 2 pots x (7"H x 3.7"W x 2.3"D). Each hanging pot includes 21" metal wire for easy hanging. Plants are not included. 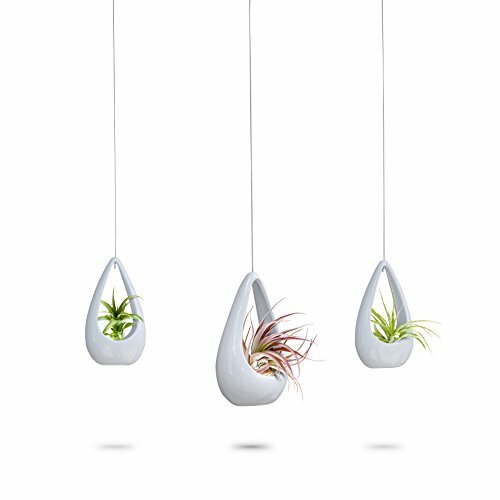 NEW PRODUCT LAUNCH SALE - BRING NATURE'S BEAUTY INSIDE: Stay trendy with these ceramic hanging pots. Easily create stylish arrangements to display succulents, air plants, or small cactus. Plants are not included. This product is deeply discounted for a limited time. Add to cart now! ADD A MODERN TOUCH TO YOUR HOME: This 3 piece contemporary hanging planter is perfect for adding a modern touch to your entryway, living room or bathroom. GIVE THE PERFECT GIFT: Just add air plants or your favorite succulent. Your friends and family will thank you! CERAMIC HANGING POT SET: 1 pot x (8.6"H x 5.3"W x 3.3"D), 2 pots x (7"H x 3.7"W x 2.3"D). Each hanging pot includes 21" metal wire for easy hanging. Plants are not included. If you have any questions about this product by 23 Bees, contact us by completing and submitting the form below. If you are looking for a specif part number, please include it with your message.